Etihad Airways is axing Airbus A380 flights from Melbourne, and with them the superjumbo's superbly spacious first class 'Apartment' suites. The Gulf carrier and Virgin Australia partner will pull the plug on the A380 from October 29, 2017 – just 16 months after commencing the daily superjumbo service between Melbourne and its Abu Dhabi hub. In its place on flights EY460/EY461 will be a Boeing 777-300ER, which represents a significant downgrade for passengers: both first class and business class on the Boeing are a generation behind the suites and seats of the Airbus A380. ... and of course a shower that's exclusive to residents of the superjumbo's nine first class suites (a handful which also have connecting doors for couples). ... and The Lobby lounge area. Travellers who had booked Etihad's Airbus A380 specifically for the quality of its first class or business class experience may now need to reroute their journey through Sydney, which will be the airline's only remaining Aussie superjumbo port. The second of Etihad's daily Melbourne services, EY462/EY463, will switch from a Boeing 777-300ER to a Boeing 787-9 from October 29 – but this will be the same two-class Boeing 787-9 as currently serves Brisbane, so it has the same business class seats as the A380 but no first class at all. The scheduling changes actually show the 787 they have rostered on is a 2-class version, so no first class at all. Which is EXACTLY what I will need to do, after awaking this morning to an Expert Flyer aircraft change alert, for our first class A380 flights that were booked for January 4 - son of a!! I think Qatar is supposed to be starting MEL-DOH A380 flights June/July. David do you know where they are rotating the A380 off to instead? Etihad have announced that they will be rotating to Paris instead at the expense of cutting down A380 for Mumbai and Melbourne. So I guess this now would further delay qantas to update their a380s to modern times. Aside from the loss in service quality, moving from an A380-800 & a B777-300ER to a B777-300ER plus a B787-9 represents a significant reduction in capacity, ex MEL, for EY. I would bet that there are some management gurus at QF eyeing potential extra load for QF9 /10. Any idea of potentially scrapping the MEL-LHR service may have just flown out the window. EY's fleet of A380's isn't that large - so it will be interesting to see which routes these frames are allocated to? I'm not guessing AUH-(North America) just yet. Can't say I'm terribly surprised. When I've flown on EY A380 ex MEL the loadings in F and J on my flights have been noticeably less than when I fly ex SYD. Between QF, EK, EY and QR capacity to Middle East and beyond, something has to give. It's a shame as the hard product on the A380 is outstanding. That said, I flew the two-class B789 on AUH-PER in J last year and it is a great aircraft and cabin. Will be interesting to see where they deploy the A380 capacity instead. The most astonishing thing is that 2 world class airlines are able to operate out of the same country simultaneously. Maybe the day will come when EY/EK merge to create a super-super brand? The real loss in this is for pax in Y. Instead of a comfortable 10 abreast A380 cabin, they get to choose between a 10 abreast 777 or a 9 abreast 787. I'd be looking elsewhere probably SQ who have a consistently good Y offering. This is a shame for MEL but I was always very surprised they chose that city for their very limited number of A380s. Its really not in the same league as prestige routes like LHR and JFK. There aren’t many airlines that would choose to send their flagship product to MEL before CDG or LAX! The 2 class 787 is FANTASTIC if you are in J – the best J flight I’ve ever had. Loads on the afternoon MEL departure are always much lower than the evening departure – i.e. much easier to find award seats. I would go out of my way to fly the 787 J over the 777-300 J.
I would expect to see the A380 deployed to either CDG or FRA (perhaps even double daily given they are no longer doing BOM) – with both the Muslim ban and electronics ban in the US I don’t think any ME3 foresees much increase in the USA. EY just around a week ago announced plans to cut Mumbai from their A380 roster in favour of Paris, and now they might be doing the same for Melbourne and using that A380 to ramp-up one of their European services. When Gulf Air run the Arabian Gulf skies for all the gulf nations, all was well. Wasn't until the Qatari's and Emiratis realised they wanted to set up their own carriers this whole mess started. Then it becomes a tribal war between Dubai, Abu Dhabi and Doha as to who has the biggest and the best toys. This big 3 ME genesis has brought about some great things however 1. Revolutionary hard and soft product strides 2. Increased airfare competition. Personally I don't think its sustainable and I would think the likes of an EK and EY merger will happen at some point. I will no longer fly Etihad. I booked a first class flight from Melbourne to Paris late in December 2016 for travel in October and November 2017. I will get the A380 on my way over but lose out on way back in November. I specifically booked Etihad for the apartment. Otherwise Singapore was my airline choice. Also flew Etihad first class last time i went to Europe. I found out about the change to using the 777 from your website and not the airline, which sneakily reissued the itinerary without no explanation of the reason for the reissue. I complained to them and asked to speak to the manager but was told to write in to the complaints line. The manager refused to take my call. I then wrote three days ago and have heard nothing. No offer to reroute or apology or call. Pathetic. The lesson here is that you can't trust this airline. If they treat first class passengers with such contempt I can't imagine how they will treat passengers in other classes. Never flying this airline again. Recommend no one else does. Back to the ever reliable Singapore Airlines for me in the future. Etihad needs to learn to learn how to communicate with passengers from SA. 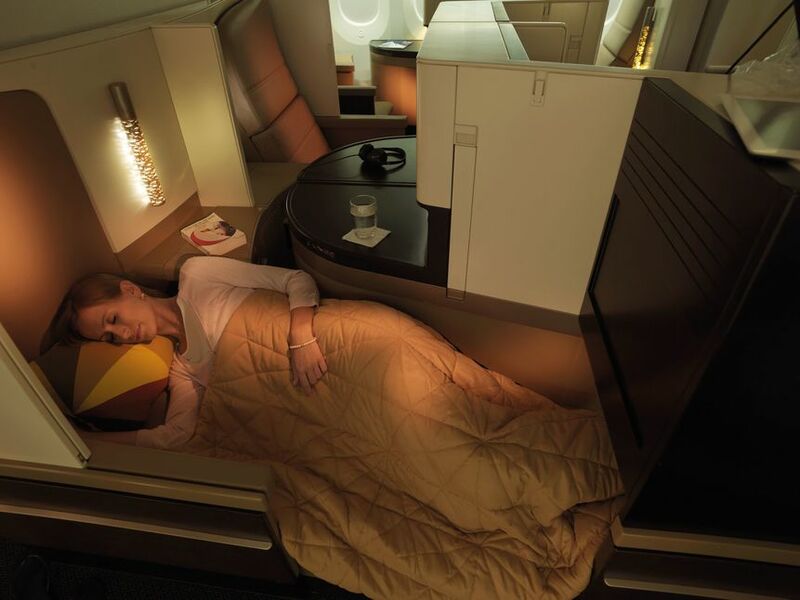 Comment on "Etihad drops Airbus A380, first class 'Apartments' from Melbourne"